We have a great appreciation for businesses that inspire green living in our community and we honor them each year at our Annual Party. Whether by promoting sustainable energy use, locally sourced goods, or otherwise, we believe these businesses contribute to a strong sense of local identity and are a crucial to the building and maintainance of a healthy, economically vibrant, and environmentally sustainable community. 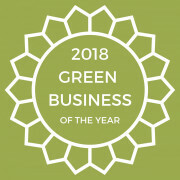 This year's Green Business of the Year nominees are Café Gelato, Colony Urban Farm, Foothills Brewing, Freedom Creative Solutions, and Roots First. Cast your vote below and hear us announce the winner at our 2018 Annual Party on Tuesday, November 13!